STOCKHOLM | Thursday 3rd August at 18:30. Free! 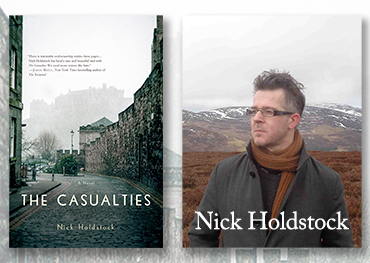 Nick Holdstock will visit us from Edinburgh to read from his novel The Casualties. Join us for this interesting evening event. Free. In The Casualties, a man recounts the final weeks of his neighborhood in Edinburgh before the apocalyptic event that only a few of the eccentric residents will survive. The Casualties explores how we see ourselves, our past and our possible futures. It asks the biggest question: How can we be saved? Nick Holdstock’s articles, reviews and essays have appeared in a wide range of US and UK publications, including the Guardian, the London Review of Books, The Times Literary Supplement, The Independent, N+1, The Los Angeles Review of Books, Dissent, VICE, Literary Review and The Dublin Review. He is also the author of two non-fiction books; The Tree That Bleeds: A Uighur Town on the Edge (2011), a book about life in China's Xinjiang province, and China's Forgotten People (2015). In 2012 he was awarded a Robert Louis Stevenson Fellowship for fiction. The Casualties is his first novel. Nick lives in Edinburgh. Feel free to like & share the facebook-event!